A recent survey of Square sellers unveiled that more than 68 per cent of business owners using the payments platform across the country are operating a home-based or mobile business. And more than half of Square sellers started their own venture to either pursue their part-time passion or develop a better work/life balance. Melanie Lange, a mum of two, is one such self-starter who now runs two businesses from her home in Adelaide. She says that the allure of flexible working hours, coupled with increased access to do-it-yourself technologies that help with building a website, accepting payments and accounting, means that it’s now easier than ever to go out on your own. We caught up with Melanie to find out about her transition to a home office, running two businesses, and how she got into crafting wooden bamboo products that Square sellers love. When did you first make the decision to start your own business? After more than 10 years of working as a graphic designer in the corporate world, I decided to take my business home (literally) and start my first business, Emkay Designs. I was working mostly with big corporate companies and when motherhood approached I thought work would be easier to juggle if I could do it on my terms, in my hours, at home. I’ve always been creative and loved design (and I never wanted to give up working), so creating a home office seemed like the best option. What was the most challenging thing about starting your own business? When I first went out on my own with the graphic design side of my business (Emkay Designs), it was really scary because I didn’t know if I would be able to attract clients to come with me. I started with a few and then my business spread by word of mouth, which helped it grow really organically. When it came to my second business, Emkay Creative, I had a whole new set of challenges. It started as a part-time hobby (crafting wooden bamboo into ornaments and photo holders), but when it came to sales and managing stock for retail, I had no experience whatsoever. Knowing how much of a product you’ll need at any given time is always a challenge in retail, but it helped that I had great business tools — like Square’s analytics platform — to help me keep track of what I’m selling and how quickly I’m selling it. What tools have you adopted to help you grow the business? When I started Emkay Creative I wasn’t sure how popular my products would be, so I decided to open an Etsy store to test it out. This was a great platform for me to start out because it helped drive customers and interest to my products. Just over a year ago, I also started using Square Reader to sell my products at markets and events. Square’s platform helps me take credit and debit card payments on the spot, sends my customers instant e-receipts and allows me to track my sales as I go. Why did you choose to work with wooden bamboo? I love making things and putting them together with my hands. I’ve also always loved working with wooden and earthy materials, so it just developed from there. I’ve made all sorts of things like gift tags, display ornaments, photo holders, magnets and wall hangings. More recently I’ve even branched out into necklaces and Christmas ornaments. How did you end up making bamboo holders for the Square Reader? It was a just a natural progeression from a personal need I had when I started selling face-to-face. 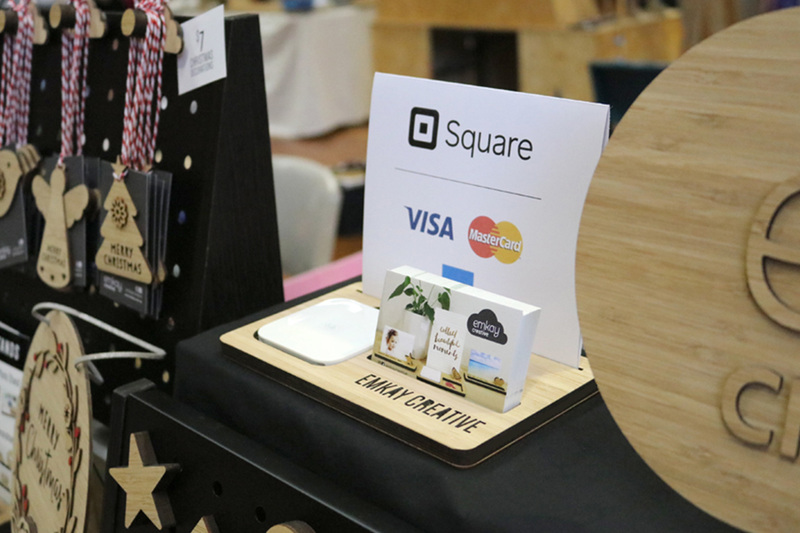 When I first started using the Square Reader to sell my products at markets, I didn’t have a nice and neat way to present the reader, my business cards and signage to let people know that I accepted card payments. Once I started using it, other traders would ask where I got it and if they could get one too and the more I made, the more requests I would get. People find it really useful to hold business information and it looks beautiful too, so now I include the holders as part of my permanent stock list! So you’re a business owner, operator, manager and designer, as well as a mum. How do you manage it all effectively? It’s busy! I will not lie, at times I feel like I am drowning. But breaking down the jobs into smaller tasks and checking them off of my list helps me feel like I am achieving what I need to do to keep moving forward. I set realistic timeframes and I always let the client or customer know if, for some reason, their project or product is running behind. Good communication is key to managing and maintaining good working relationships. The encouragement and endless support I get from my husband and family is amazing, I also make use of any down time or slower periods and take some time for myself to recharge. This usually involves going to the gym, a walk on the beach or lunch with a friend. I am a firm believer that you need to take care of yourself first to be able to take care of everything else. What advice do you have for others looking to start their own business from home? Have a passion for your business. If you love what you are doing then it will show in your products or services. When you start a business it is very time consuming and there are always things on your to-do list, so just start small and gradually build up your client base — don’t bite off more than you can chew at the beginning. For me, talking to other designers at market events has given me valuable tips for selling and marketing to grow my business.